I'd already worked with a textile design company in Kolkata, a few years back, and had fallen a little in love with the country. When I received a call from a friend, Annik Chandra Pelle, director of the Ahmedabad office of the Alliance Francais, to join her in a cultural event in Ahmedabad, I jumped at the chance. 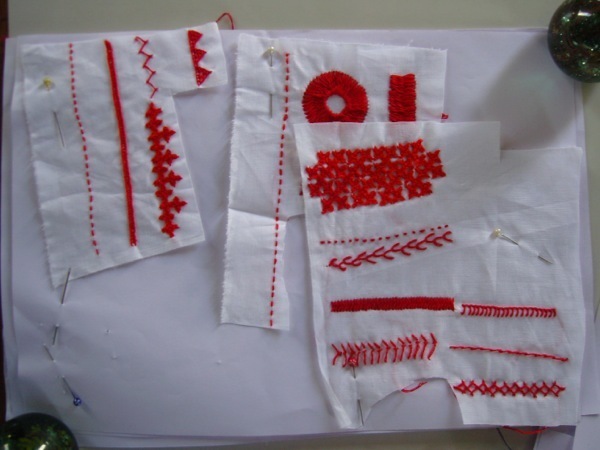 Part of this event would be a project with an NGO called SEWA (the Self Employed Women's Association), who do some very interesting and valuable work with women embroiderers living in the villages of the Kutch region of Gujarat. It was exactly the kind of project I dream of being asked to participate in! So without a moment’s hesitation I agreed. I flew off In Spring 2009, with some considerable excitement, a stock of anti-malaria tablets, and just a few magazine cuttings for inspiration! My first day of work was at the SEWA Trade Facilitation Centre situated in one of Ahmedabads’ old converted textile mills. This is the organisations' nerve centre. It contains a small design unit, meeting rooms and offices, and a well-equipped production facility (with modern equipment) capable of fulfilling large orders. During my first week several women artisans came to work with me in the design studio. I had made the decision to arrive without any fixed ideas. I wanted to see their traditional stitches and techniques, and take inspiration from those. What I was clear about, was that I wanted to develop something quite new and fresh from these traditions. Step by step patterns were made and samples were cut, and we were now ready for the next stage. Early one morning, I set off with our driver and two design assistants on the 3-hour journey to Radanpur. There, on the edges of the Kutch desert, we found a large purpose-built warehouse. From here, production can be organised and controlled. 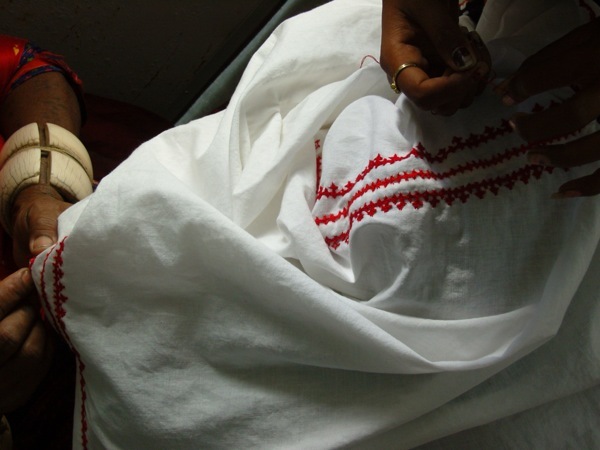 Usually, pre-prepared patterns for textile items, such as cushion covers, are sent out here from Ahmedabad, and thence from here are distributed to the artisans who live in the surrounding villages to embroider. On this occasion, a group of about 20 women had been invited to the warehouse to take part in a 2-day workshop with us. They had already arrived, and were eagerly awaiting us. They set to work embroidering directly onto our pre-cut pattern pieces, using my designs. Time has past… there was a second visit, and finally we are able to bring you our first collection!